BMW’s bold vision of the future is a shape-shifting, self-driving supercomputer with X-ray vision a supercar with superpowers. This is BMW’s centenary year. For one of the world’s most respected car makers, it could be an excuse for a self-congratulatory trawl through the back catalogue and yes there has been a bit of that. But BMW also has a progressive outlook, so is turning towards its second century by designing a one-off concept car. 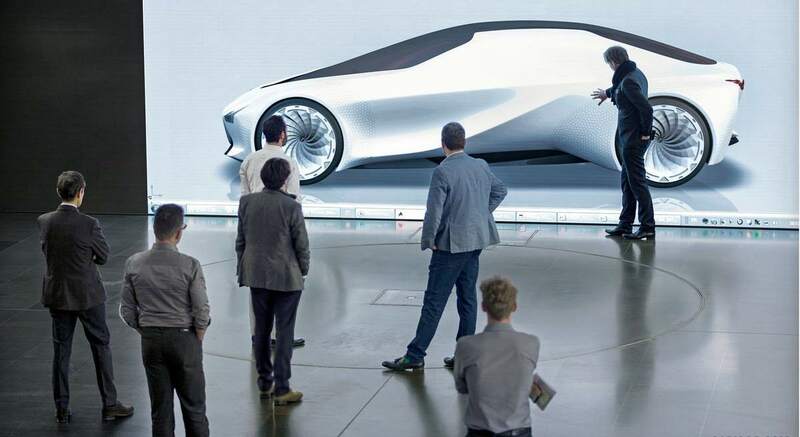 It hypothesises a batch of ideas the firm sees itself putting into production cars two or three decades from now. In some ways it’s also a response to a striking paradox of the coming era. BMW has always been known for driving dynamics, and for the particular response and sound of its combustion engines and transmissions. 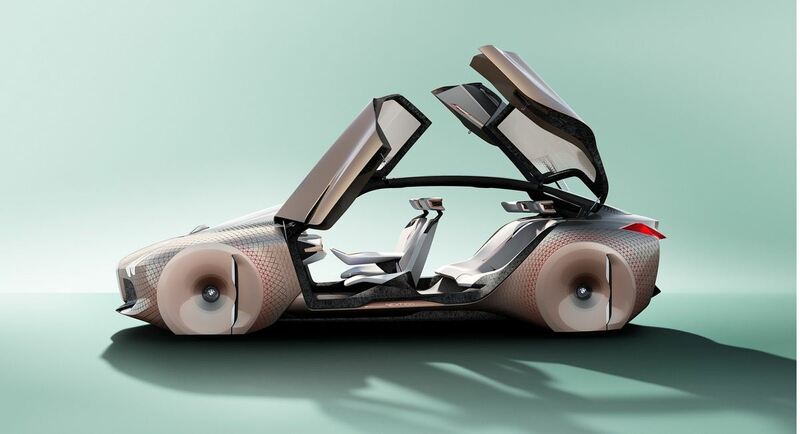 But future suspension systems will be more controlled by electronics and autonomous driving systems. And future powertrains will be simple electric motors with single-ratio transmissions whether the electricity comes from hybrid systems, batteries or fuel cells. 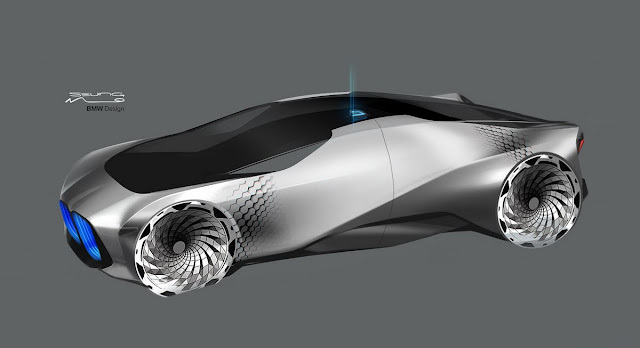 So the whole ‘feel’ of the car, both its dynamics and its powertrain, will move more into the domain of software. There’s a danger they might be easily reproduced by rivals. 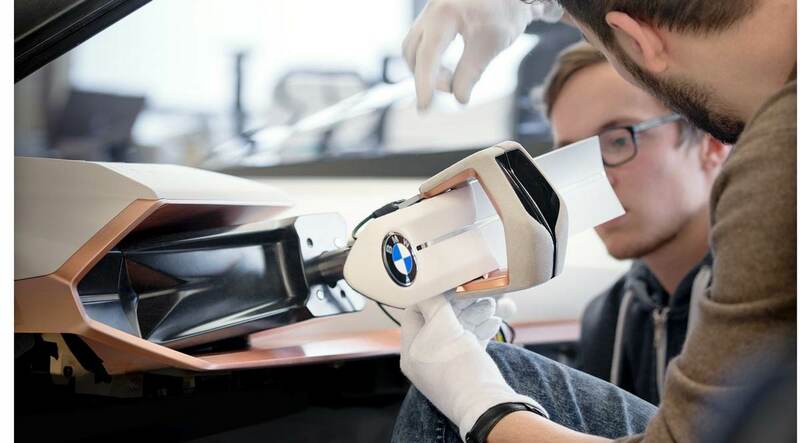 So BMW is working hard on new expressions of premium and dynamic design for the connected, digital, sharing era. 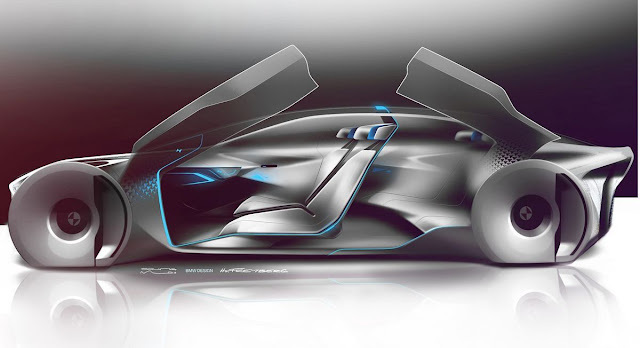 The Vision Next 100, as it’s rather un-snappily named, is supposed to be a car you would want to drive. It includes some novel driver-assist features aimed at making you a better driver rather than simply wresting control from you. But when you want it to, it can drive itself, and in that state it morphs its interior into something altogether more comfortable and sociable. 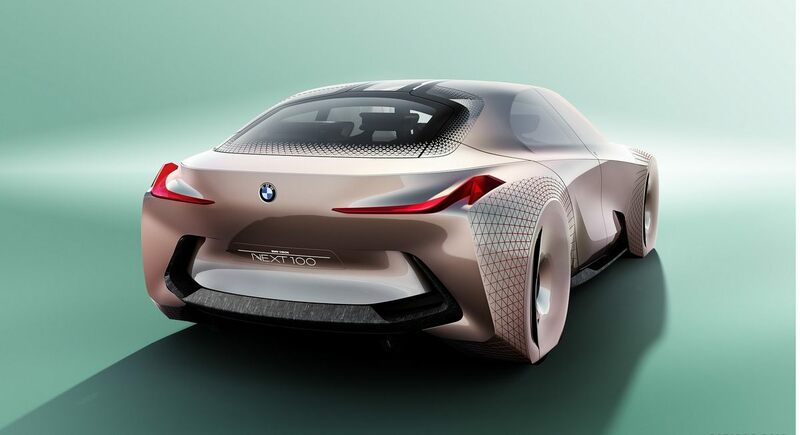 And ironically for a company whose name translates as the Bavarian Engine Factory, BMW is revealing nothing about the car’s proposed form of propulsion, other than to say its zero emissions. The BMW has two main driving modes. The first, called ‘Boost’, is where the driver is in charge. The second, known as ‘Ease’, lets the machine take over. The design of the whole interior very much follows on from these states. In Boost mode, the driver faces straight ahead, with the steering wheel and center console in the positions we’d find familiar today. Conventional instruments are nowhere to be seen. Instead, the entire windscreen functions as a head-up display. It doesn’t just project familiar information such as speed and navigation instructions, either. It adds augmented reality, for instance superimposing into the field of view a line for the driver to follow for smoothest cornering, and the ideal braking point in effect driver coaching. It also projects, in a representation of their real position, hazards which the car’s external sensors and cameras can see but which are still obscured from the driver’s field of vision. That ability will be enhanced by the car’s extensive external networking. For instance if the car in front, around a blind bend, skids on a patch of ice, it will broadcast the position of the ice back to your BMW. At city junctions, the same system would warn of other cars before they came into view, or point to a cyclist hidden behind a truck. It could also simulate the view ahead when reality is blanketed in fog, and assist with night vision. So Boost would make you a better and safer driver. But if you don’t want to drive at all, switch to Ease mode. 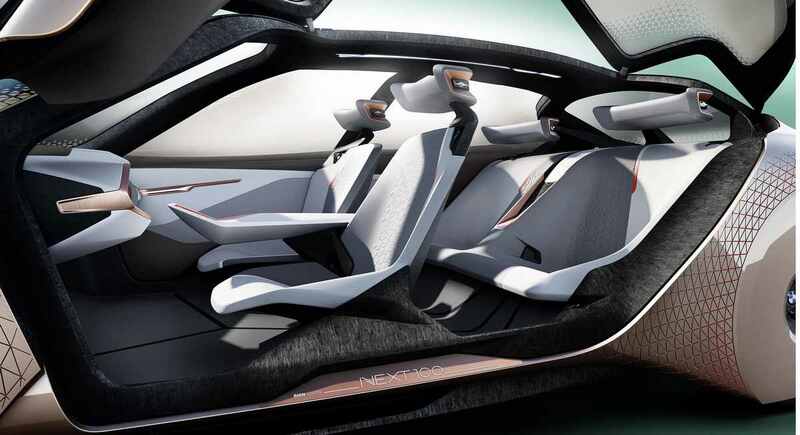 The steering wheel retracts into the dashboard, the center console glides backward and the front seats change shape and position, turning into a more conversational, lounge-like V-shape formation. The car becomes fully autonomous. Because the driver needs far less information, the head-up display takes on a new role, as a connected entertainment and media center. How real or feasible is all this with today’s tech? Surprisingly close. Already, BMW sells cars that can on a slow-moving urban road follow the car in front, braking and accelerating and steering by themselves. They can do the same on motorways at high speed. Tesla’s Autopilot feature allows autonomous driving in a wider range of situations, but still can’t negotiate junctions or city streets. Mercedes has demonstrated that using little more hardware than the sensors already fitted to its S-class a car can drive through cities and rural roads. But to do so reliably its navigation system needs higher-resolution, fully updated data. That next-gen mapping is underway now. Google’s autonomous driving fleet, extensively tested in several US states, points to the same thing. So most experts believe that autonomous driving will be technically feasible in a very few years from now. Sure, hurdles exist in the areas of traffic law and insurance (who’s responsible if an autonomously driven car does crash?) but they’re being tackled. 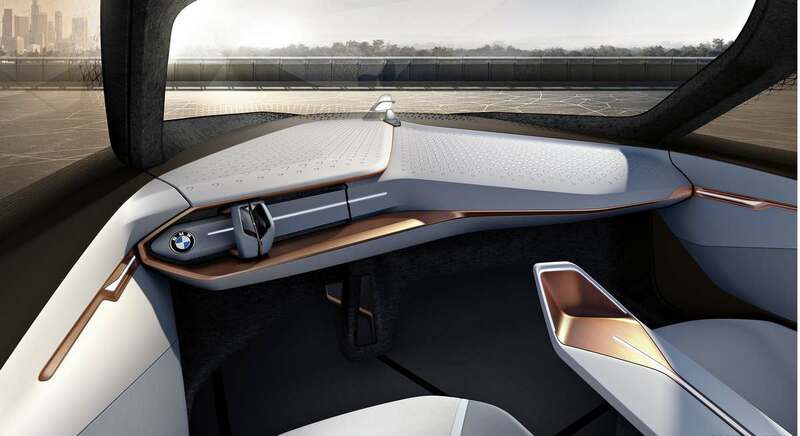 Some of the features of BMW’s concept namely the warnings of hazards around the corner or hidden across a junction rely on a level of external communication that’s as yet unavailable. Protocols are being developed across the industry so that cars will be able to distribute position and hazard data in spontaneous peer-to-peer networks. But standards adoption is very slow. Over the years, what has happened instead is that cars’ ability to sense their surroundings has improved so fast that they haven’t needed as much externally supplied data as was expected. For example, many traffic engineers once proposed that every speed limit sign carry a transponder to tell passing cars the limit. Nowadays many quite mundane cars simply use cameras to read the signs themselves. One of BMW’s classic body design themes is to put the wheels well towards the ends of the car. It gives what designers call a ‘strong stance’ the car seems to be hugging the road. But the Vision Next 100’s bodywork is pulled down to cover the wheels, to reduce air turbulence and drag. Which is all very well in a straight line, but what happens when the front wheels need to steer? Step forward another innovation, called ‘Alive Geometry’. 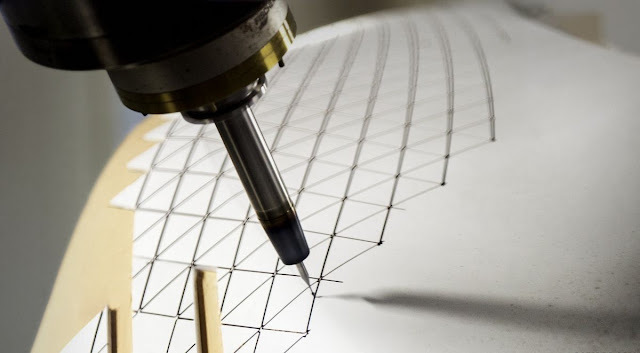 Some 800 moving triangles are set into the car’s surfaces, mainly on the front wings and the instrument panel. By opening and closing, they enable the skin to change shape and contour. So it can stretch over the front wheels as they turn. Inside the car, the same material covers the dashboard. 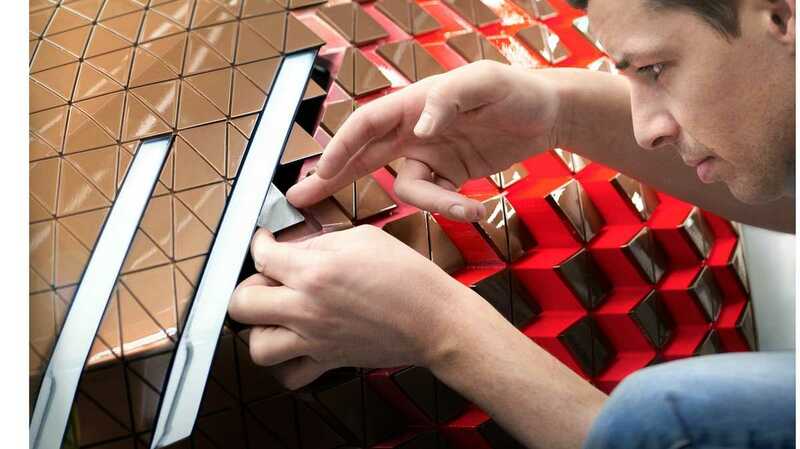 As the triangles open, they reveal a lower layer coloured red. This is what BMW calls a ‘preconscious signaling device’ in the occupants’ peripheral vision. In Ease mode, the triangles subtly prepare the passengers if the car is about to break or turn, moving in a Mexican wave across the dashboard. Passengers would brace themselves almost without thinking. Sounds like a worthwhile remedy for car sickness. In Boost mode, if a danger is coming up, a wave of red spreads across like a gesture towards the hazard. 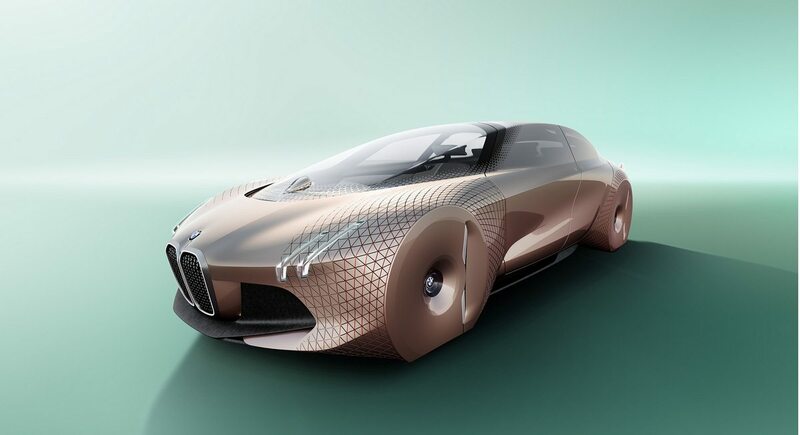 BMW admits that something like Alive Geometry is still a long way from reality. 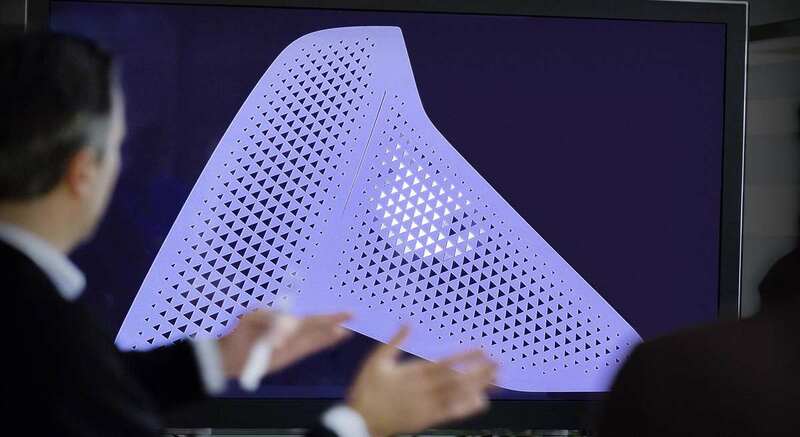 To be produced, it would probably need what engineer’s call ‘4D printing’. 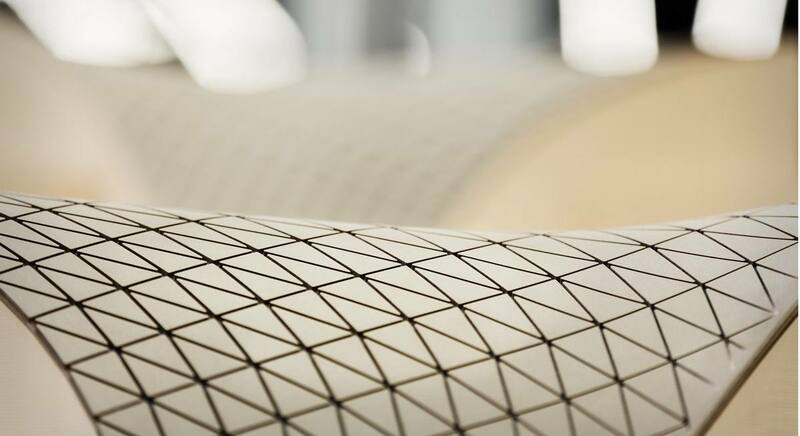 In 3D printing the shape of an object is printed up to match a digital model, in a uniform material. For the fourth dimension, the printed piece would be made from multiple materials, giving scope for active, even intelligent, parts. The car has very few physical controls. Instead, cameras read the position of your hand and fingers, so you can control the car’s features and menus by gestures pinching and swiping in mid-air. 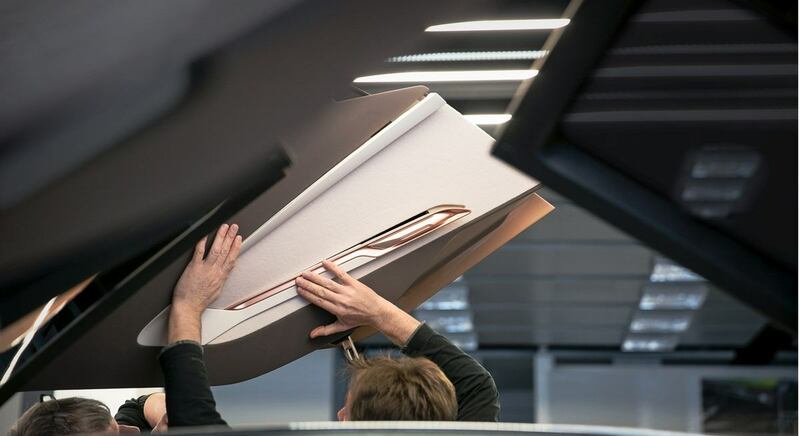 Gesture control is already available on BMW’s 7-series saloon, although it has a limited vocabulary so far. 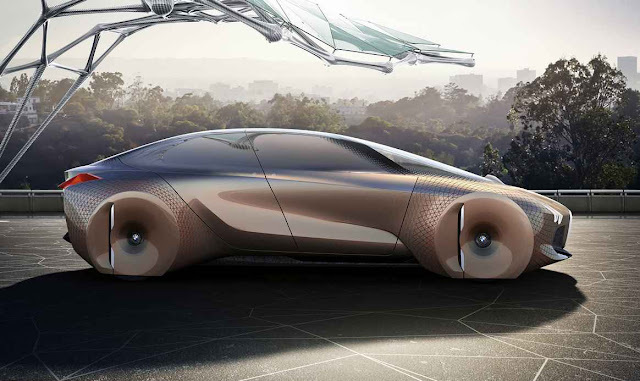 The Vision Next 100 is networked into BMW’s servers, which are expected to know more and more about the driver’s life. Data includes your travelling habits, your diary and address book, the way you configure your car, your kind of music even the embarrassing tracks and so on. Thus aware, it can for instance pre-program destinations according to the time of day, automatically go to recharging points, find entertainment for your likely mood, and so on. Whether you view this as helpful or creepy, it’s no more than an extension of the virtual assistants that are already finding their way into most of our lives.